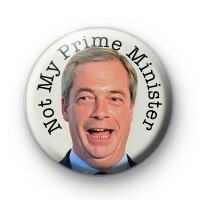 An anti-Nigel Farage badge designed following the 2016 EU referendum in the UK. The former UKIP leader has gone quiet but you can show your political feeling with a not my prime minister Nigel Farage badge. These badges are popular with all of our Pro European Union customers and have been spotted at a lot of rallies recently. We have a huge range of politics badges and a lot of EU badges available in our political badge category.